Follow-Through (Backswing) Contact or Batter Interference? Nationals catcher Matt Wieters campaigned for a backswing/follow-through contact (not interference) call after a throwing error on a passed ball third strike allowed Chicago to score a sixth run with two outs in the top of the 5th inning. 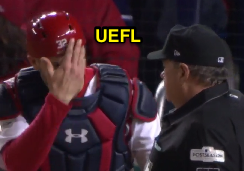 Was HP Umpire Jerry Layne's no-call the correct ruling? Baez's bat makes contact with Wieters' mask. The Play: With two out and two on (R1, R2) in the top of the 5th inning of Game 5 of the Cubs-Nationals NLDS, Cubs batter Javier Baez swung and missed at a 0-2 slider from Nationals pitcher Max Scherzer, the pitched ball eluding Matt Wieters, who, in attempting to throw to first base to retire Baez on the uncaught third strike, overthrew his target for an unearned run-producing error. Replays indicate that Baez's bat incidentally made contact with Wieters on his follow-through. Analysis: As we learned most recently, a batter becomes a runner on an uncaught third strike when two are out and may attempt to advance to first base before being put out. Related Post: Yankees End Indians' ALDS on Uncaught Third Strike (10/11/17). The question here is whether Baez's contact with Wieters constitutes backswing or follow-through contact (not interference). To answer this question, we first must cite the relevant regulation, which is found in Official Baseball Rule 6.03(a)(3) & (4) Comment: "If a batter strikes at a ball and misses and swings so hard he carries the bat all the way around and, in the umpire’s judgment, unintentionally hits the catcher or the ball in back of him on the backswing, it shall be called a strike only (not interference). The ball will be dead, however, and no runner shall advance on the play." With two strikes on the batter, a dead ball strike makes the count x-3, which means the back-swinging batter shall be ruled out on strikes, uncaught or not. See also the following 2016 Case Play regarding David Ortiz's backswing-aided strikeout (and double play). Related Post: Case Play 2016-9 - A Backswing on Strike 3 [Solved] (8/26/16). SIDEBAR: See above Case Play 2016-9 for rules differences between OBR, NCAA, and NFHS. In high school only, follow-through contact is interference. The technical lower-level lexicon has also established that "backswing contact" occurs pre-pitch whereas "follow-through" contact occurs post-pitch. Wieters campaigns to Layne for a call. Seems simple, and at face value, this must be follow-through contact (not interference), right? Before we unequivocally declare, "case closed," let's read on. 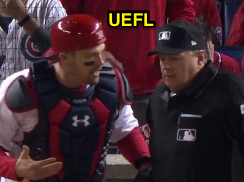 6.03(a)(3) & (4) Comment is merely an approved ruling or case play of OBR 6.03(a)(3), which states, "A batter is out for illegal action when—He interferes with the catcher’s fielding or throwing by stepping out of the batter’s box or making any other movement that hinders the catcher’s play at home base," and 6.03(a)(4), which states, "He throws his bat into fair or foul territory and hits a catcher (including the catcher's glove) and the catcher was attempting to catch a pitch with a runner(s) on base and/or the pitch was a third strike." Plays at home base include the obvious (attempting to field a batted ball or bunt in front of home plate), attempting to tag out or throw out a runner or batter (e.g., as in a stolen base or pickoff), or another similar action that the catcher performs in the home plate area. For instance, when Big Papi's 2016 backswing contact with two strikes turned into an inning-ending double play with his catcher attempting to throw out a stealing runner, that would qualify as a play at home base. SIDEBAR: We DO know, per the MLB Umpire Manual, that if the "catcher's initial throw directly retires a runner despite the infraction," the follow-through contact is disregarded, similar to batter interference in 6.03(c) proper. An "initial throw" implies a play that initiates at home base (e.g., a stolen base or pickoff throw); however, there was no "initial throw" nor were any Cubs retired on Thursday night's NLDS Game 5 play. Wieters demonstrates the bat contact. If 6.03(a)(3) & (4) Comment falls hierarchically underneath 6.03(a)(3) proper, would it too be subject to the "catcher's play at home base" criterion? Refer to OBR's "Important Notes" section (page v) for more information about what Comments actually are: "The Playing Rules Committee, at its December 1977 meeting, voted to incorporate the Notes/Case Book/Comments section directly into the Official Baseball Rules at the appropriate places. Basically, the Case Book interprets or elaborates on the basic rules and in essence have the same effect as rules when applied to particular sections for which they are intended." However, Rule 6.03(a)(4)—for which the Comment also applies—says nothing of a "play at home base," but does discuss a catcher attempting to catch a pitch with runners (or a third strike). 1) Because Wieters' passed ball occurred prior to Baez's unintentional follow-through contact, there is no cause for a call, as Baez's backswing had no relation to Wieters' play at home base; Wieters' inaccurate throw to first base was made from the warning track just feet from the backstop—a difficult throw for any fielder to make. No call is the correct call... But wait, there's more! 2) Because follow-through contact is specifically "not interference," it is not subject to the same dose of umpire discretion or judgment for how severe the violation was relative to hindrance—if there was any follow-through contact between bat and catcher (or ball), it must be ruled as such. 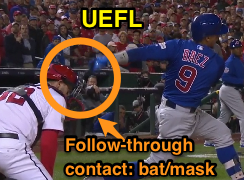 For all we know, Baez's bat brush of Wieters' mask induced a minor head injury that in turn caused the poor throw. Nonetheless, that isn't an umpire's concern. Because OBR 6.03(a)(3) & (4) Comment simply states "If a batter...unintentionally hits the catcher...on the backswing, it shall be called a strike only (not interference). The ball will be dead," the call must be made regardless of severity when any instance of follow-through contact occurs. Recall 6.03(a) is about "illegal action," and not about "interference." Only 6.03(a)(3) concerns interference. Furthermore, if Comments, which come from Case Book, "have the same effect as rules when applied to particular sections for which they are intended," then, hierarchically, 6.03(a)(3) & (4) Comment carries precisely the same weight as 6.03(a)(3) and 6.03(a)(4) proper, meaning that the follow-through contact provision logically stands on its own, without reference to 6.03(a)(3)'s remarks concerning interference at "home base." For instance, 6.03(a) also states "a batter is out for illegal action," yet there is no question that the batter is not out when follow-through contact occurs with less than two strikes. Thus, by the same logical token, 6.03(a)(3)'s "play at home base" phrase should similarly have no bearing on 6.03(a)(3) & (4) Comment concerning follow-through contact, especially when 6.03(a)(4) makes no reference to a play at home base other than attempting to catch a pitch. By contrast, one could argue that although the pitch was already uncaught by the time of the contact, if the ball had caromed out of play on the passed ball, the award would still be one base. Why? Because it was still a pitched ball. SIDEBAR: Just for fun, the next batter, Tommy La Stella, reached first base due to catcher's interference on Wieters, a rare back-to-back sequence of E2's (with a passed ball to boot). Thus, the follow-through contact occurred while the ball was still a "pitched ball," so the pitched ball provision of 6.03(a)(4) is still relevant (playing devil's advocate). It is not interference, but an illegal action for which the batter is out (on the dead ball third strike). Henceforth, the logic covers both trains of thought (that 6.03(a)(3) or (4) matters or that 6.03(a)(3) or (4) does not matter). In conclusion, no call is the incorrect call.